Since October 1978, the GOS was tested on an aircraft -flying laboratory based on the Tu- 124 - LL-124. Tests of simplified prototypes of K-73 missiles from ground-based launchers began in 1979. The work of the gas-dynamic control surfaces was tested. 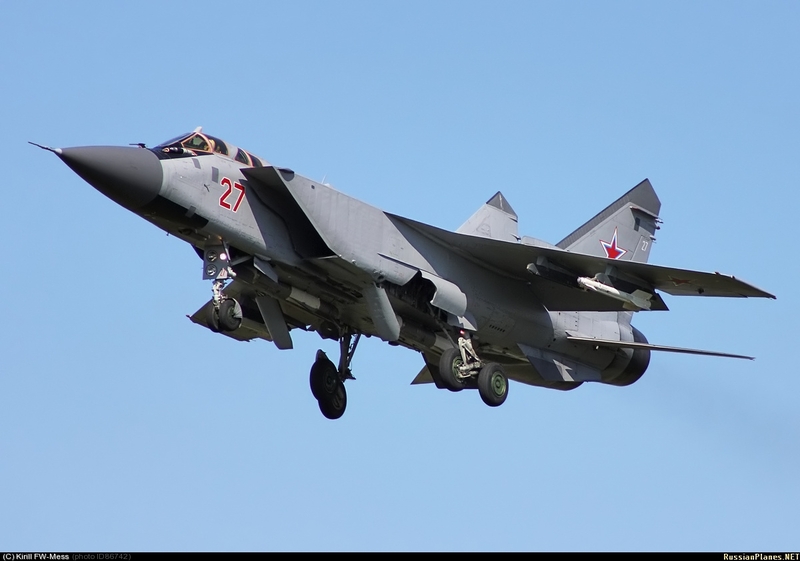 In the same 1979, within the framework of factory tests, 8 MiG-23ML missions (board No. 123) and three launches of K-73 missiles were performed. In 1980, for the first time, a MiG - 17 flying target was shot down from this MiG -23ML. In 1981, the third serial MiG-29 (No. 9-19) joined the tests - the MiG-21M target was shot down from it. Educational-acting model of the R- 73L with an optical fuse. Exhibition of technology of The in Ramenskoye, the 100th anniversary of the Russian Air the Force, 12.08.2012 (photo The - of pfc-joker is, http://pfc-joker.livejournal.com ). Suspension missile R-73, mid-late 1980s (file photo Cabal, http://militaryphotos.net ). 1981-1982 with In work on the Conditions creation of air-to-air Missiles, the which Were conducted by OKB Molniya, WAS Transferred to the Vympel OKB. Gennady Alexandrovich Sokolovsky (to 1994) was appointed Chief Designer. The missile was commissioned as R-73 by the Decree of the Council of Ministers of the USSR of June 22, 1984 and the order of the USSR Ministry of Defense No. 00113 (1984). The beginning of mass production (model P-73 MDR-1) - 1987. The model of rocket 73RMD P-2 has the ability to launch into the rear hemisphere of the carrier and can be used against air-to-air missiles. The chief designer of the rocket since 1994 - Yu.K.Zakharov. Serial production of the R-73 missiles began in 1983 and until 1992 carried out by was the Tbilisi Aviation Plant (Tbilisi, Georgia), and at the Moscow Kommunar plant ( East - Tymchuk D.. A total of 6,000 rockets were manufactured in Tbilisi. In the 1990s, probably the production of missiles for export and, possibly, for the Russian Air Force was conducted by pilot production of the Vympel GosMDB. 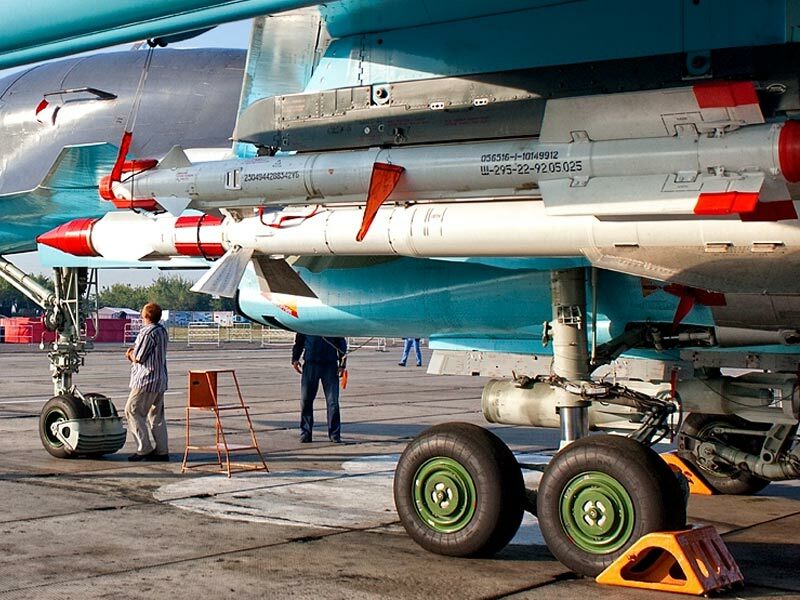 As of the end of the 1990s - the beginning of the 2000s, the repair and maintenance of the missiles is carried out by the 711th aircraft repair plant in the city of Borisoglebsk. Launcher - missiles are launched from the P-72 (APU-73-1) and P- 72-1D (APU-73-1D) or P-72-1BD2 launchers. 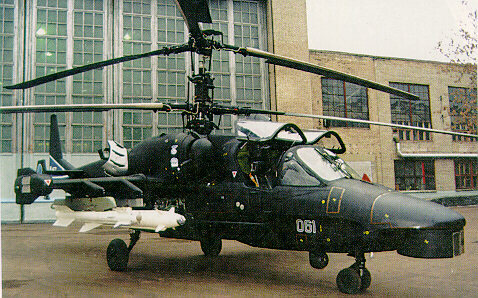 In the media of the 1990s, the Ka- 50 launcher, APU-62-1M, was also mentioned. Missiles are mounted on launchers using three tiers of yoke. 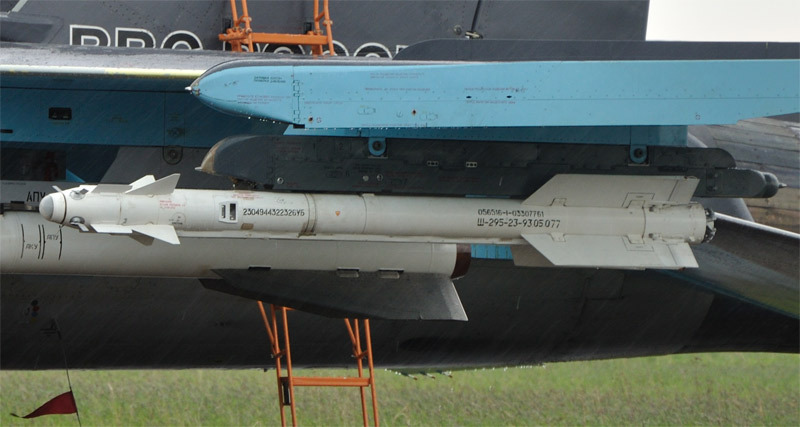 The RVV-MD rocket may be suspended under the P-72-1D (APU-73-1D) or P-72-1BD2 launchers. Design - the rocket is made according to the aerodynamic "A duck" the scheme. Aerodynamic angle sensors (angle of attack and slip), destabilizers and aerodynamic control surfaces are located in the nose. In the tail - wing with ailerons. The rocket is also equipped with four- section gas-dynamic rudders. In the technical specifications for the creation of an ultra-maneuverable rocket - with the possibility of reaching angles of attack of about 40 degrees - it was proposed to use gas -dynamic control due to the inefficiency of conventional rudders. The initial version of the rocket project did not provide for aerodynamic controls - only gas-dynamic.It was supposed to use wingless body with a tail stabilizer of 6 aerodynamic surfaces. 1. of The first compartment is the GPS with the aerodynamic controls. 2. The second compartment - steering mice, autopilot and proximity fuze. 3. The third compartment is a gas generator . 4. The fourth compartment is a combat unit with internal PIM. of The rocket old body is made of aluminum Alloys has, the solid rocket motor old body is steel. The connections of the compartments are bayonet, the connections of the extreme compartments are flanged. The fully assembled rocket is delivered to the troops in a germcoat and a wooden closure. 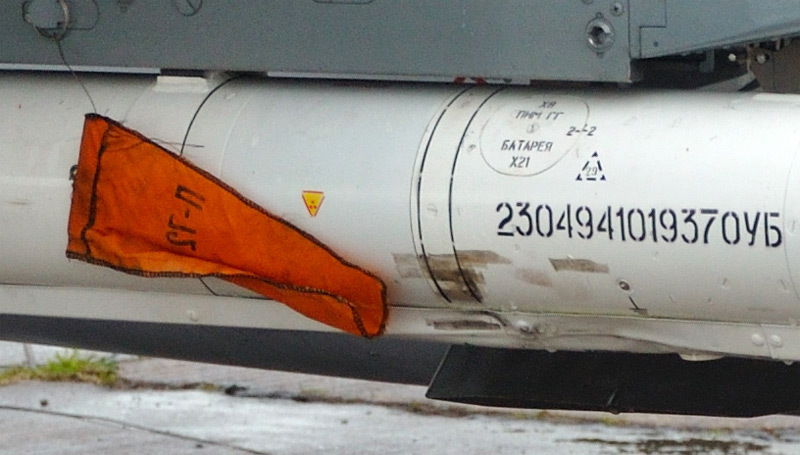 The combat training model of the R- 73L missile with an optical fuse under the Su- 34 bort No. 05 is red. Exhibition of technology in Pushkin, August 2012 (photo The - of Yevgeny Polivanov, http://russianes.net/id84156 ). Steering machines work on the working body, which is produced by a solid gas generator. The working body enters the tail section through a special channel located outside the rocket body. Educational split model of the R-73 rocket. From left to right: tail section with engine interceptors and aileron steering, third, second and first compartments. UEFA Training Aviation Personnel Lipetsk Military and the Test Center of the Russian of Ministry of Defense named is the after the VP Chkalov, 01.27.2012 (photo The - Vitaly Kuzmin's, http://vitalykuzmin.net ). 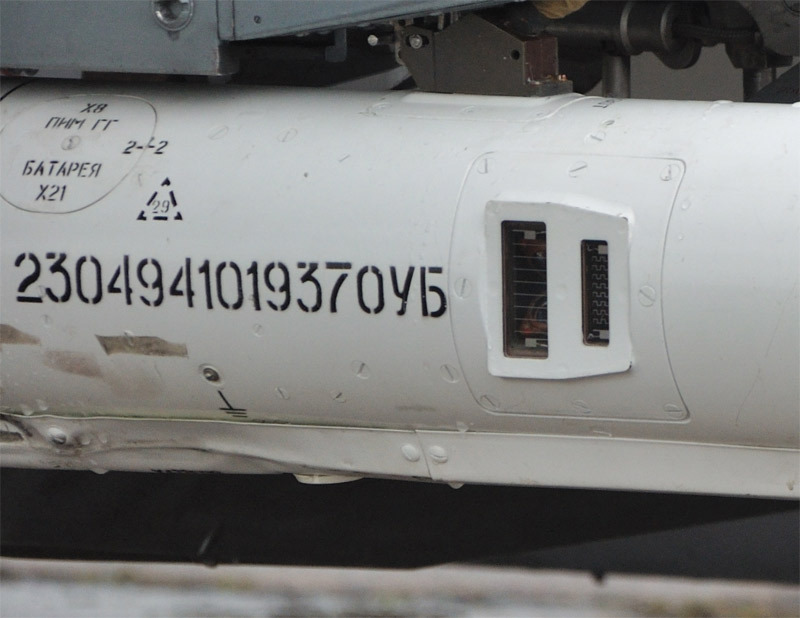 GOS and aerodynamic controls of a combat training missile R-73L. Of technology in Exhibition Exhibitions Pushkin, 02.06.2012 (photo The - of pfc-joker is, http://pfc-joker.livejournal.com ). Guidance system and the Control - the missile control system includes an autopilot with roll Stabilization and an IK profile of GOS. The roll stabilization is carried out by mechanically connected ailerons. At the stage of preliminary design of the K- 73 rocket, the use of the full- range IR GOS was not expected. The development of the GOS was carried out by the Kiev software company Arsenal (chief designer - AV Molody) on a competitive basis with the NPO Geofizika (Moscow). The Arsenal software was developed as a compact and all-view GSN Mayak / OGS MK- 80 (RMD-2). The Mayak also implemented new effective measures to combat natural and man-made interference. Along with the appropriate selection of the sensitivity range of the photodetector, a pulse-time modulation of the signal was used in the GOS equipment, a digital signal processing unit was introduced with several independent channels.Improve efficiency by the To Hitting the more vulnerable and by important elements of the target, aiming AT Been a point has an applied, Shifted forward relative is to the nozzle of the engine of the aircraft's target. The original version of the K-73 missile was redesigned for this hsn. 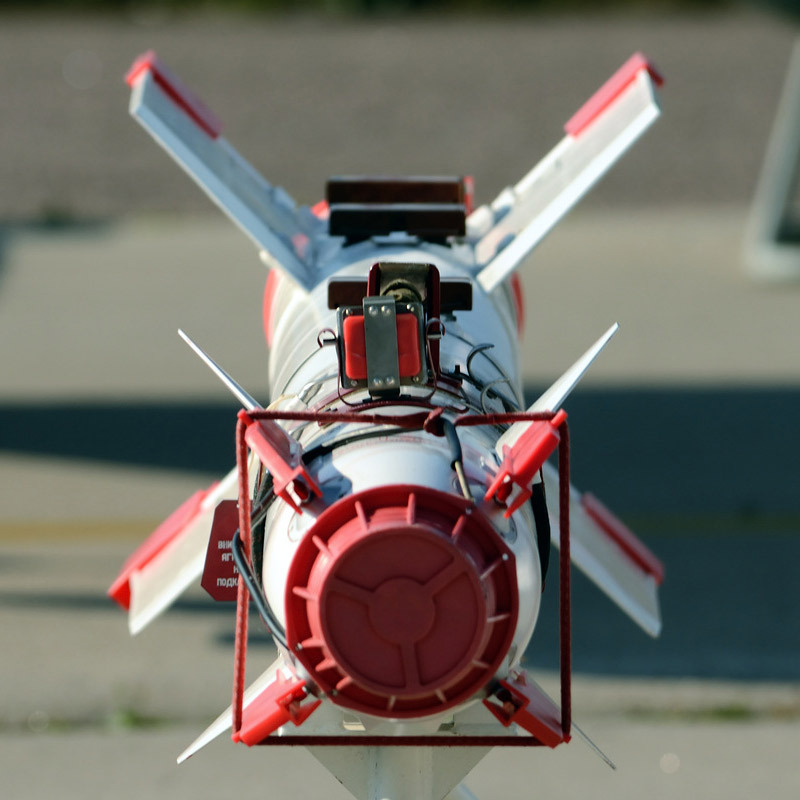 The homing head of the RMD-2 missile has increased noise immunity against IR countermeasures and is built on a digital element base, which makes it easy to reprogram tracking and interception algorithms. Improved ability to attack low-flying targets . It is with the RD-73 RMD-2 rocket that a maneuver is possible with launching a rocket into the rear hemisphere of the carrier and it is possible to attack enemy air-to-air missiles. 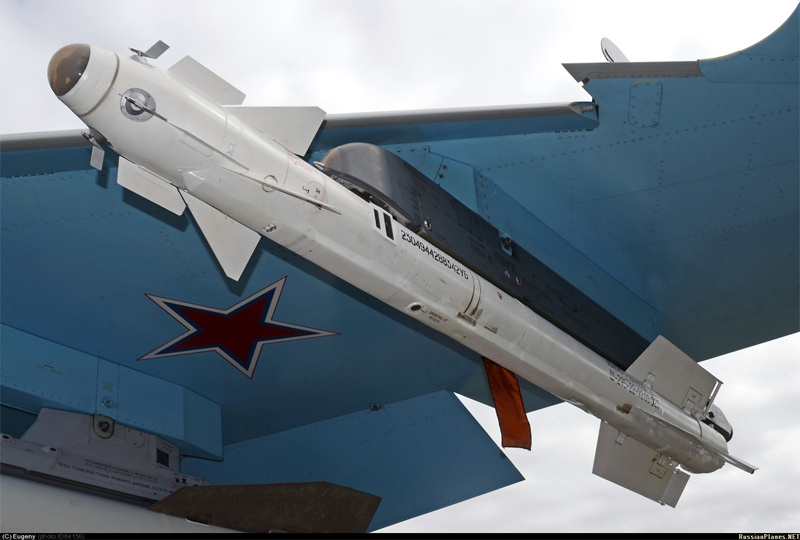 On the MiG-29 and Su-27 aircraft, the missiles can be used together with the slit of the target designation system, the Schel, which significantly increases the combat capabilities of the fighter. In the 1990s, at the arms exhibitions, Vympel Design Bureau displayed footage of K-73 missile tests with a launch backwards - in order to defend strike aircraft and bombers. 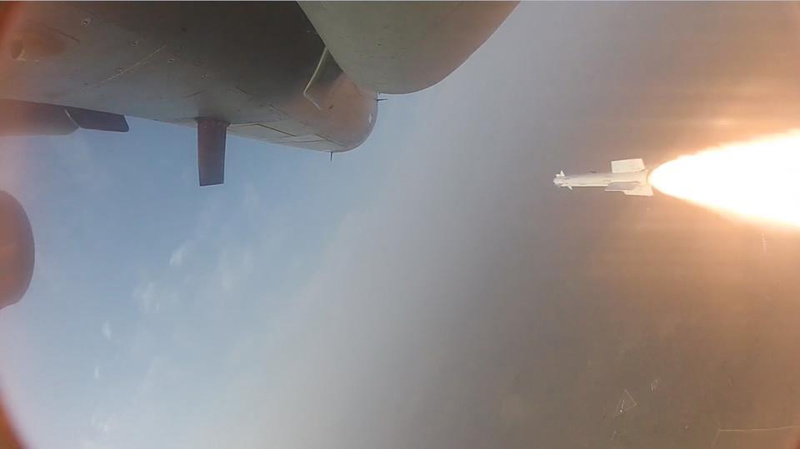 Gas-dynamic controls and ailerons training and combat missile R-73L. Art exhibition at the Pushkin, 02.06.2012 (photo - of pfc-joker is, http://pfc-joker.livejournal.com ). It was a rotary nozzle that showed up to 3% (spoilers) to 3%. Type of warhead - rod, PIM is located inside the warhead. - optical laser (R-73L, P-73EL) "Amber" ( ist - Tymchuk D. ) . Yellow icon (uranium rods) combat training R-73L. Art exhibition at the Pushkin, 02.06.2012 (photo - of pfc-joker is, http://pfc-joker.livejournal.com ). 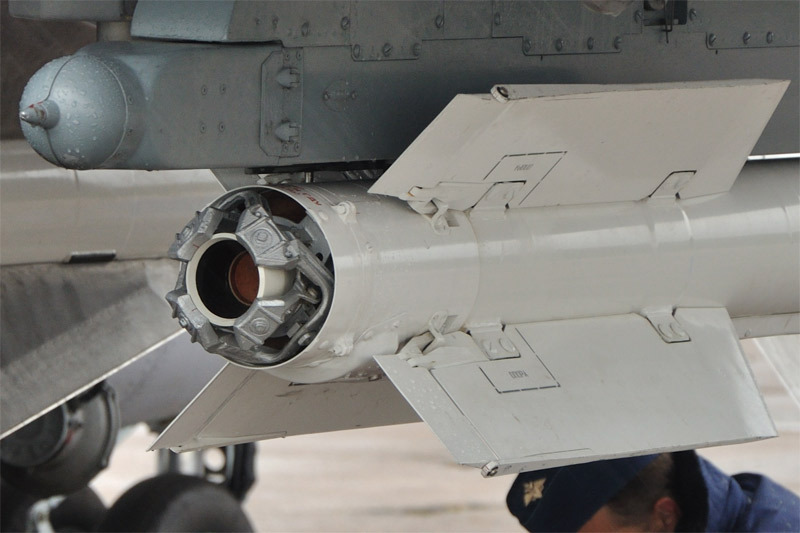 Window optical laser blaster "Amber" combat training missile R-73L. Art exhibition at the Pushkin, 02.06.2012 (photo - of pfc-joker is, http://pfc-joker.livejournal.com ). under the Su-27 (an exhibition in Moscow, August 1989). Educational-acting samples of R-73L optical fuze and P-72 with radio. Art exhibition in Ramenskoye, the 100th anniversary of the Russian Air Force, 12.08.2012 (photo - of pfc-joker is, http://pfc-joker.livejournal.com ). - K-73 (preliminary design) - the initial version of the K- 73 was performed as a super-maneuverable missile without aerodynamic controls. GSN - either the development of NPO " Geophysics" or software "Arsenal" (GSN "Mayak"). - R-73 / R-73 MDR-1 - the name of the rocket after its adoption by Decree of 06.22.1984 - the first production version of the rocket. Probably, the RMD-1 is the symbol of the R-72 rocket with the first version of the control system and the GOS. 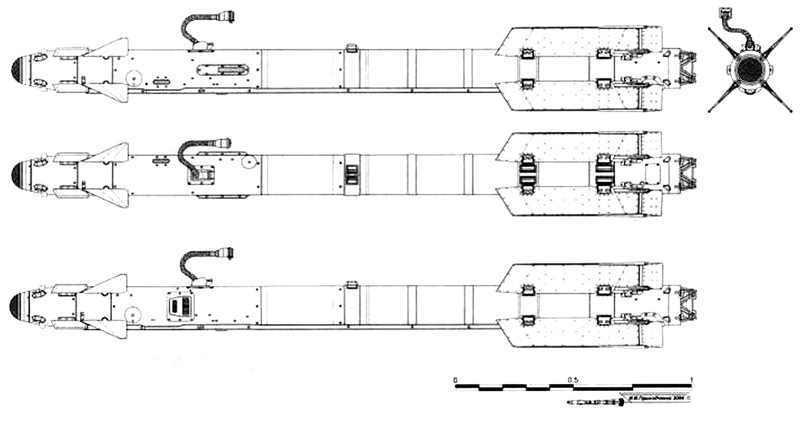 Projections of the R-73 rocket RDM -1 - AA-11 ARCHER (figure AV Karpenko, 2000, http://bastion-karpenko.narod.ru ). - K-73E - the export version of the rocket, analogue of the R-73RMD-1 rocket, has been exported since 1988 (GDR). 73E-R Rocket ( drawing ICB "Vympel"). - R-73L / R-73EL - an export version of the rocket with an optical laser contactless fuse was first shown at the MAKS- 1999 air show, but in fact the rocket with an optical fuse (without announcement) was first shown in August in 1989 at the first Moscow air show. The rocket is equipped with an optical laser fuse. Combat training sample R-73L optical fuse. Art exhibition at the Pushkin, 02.06.2012 (photo - of pfc-joker is, http://pfc-joker.livejournal.com). 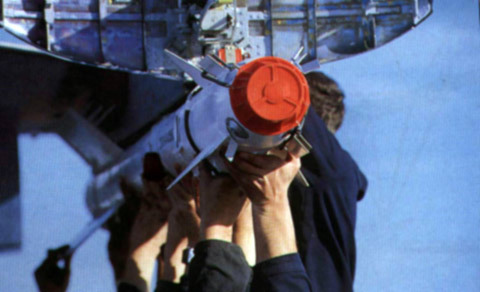 Educational-working model P-73L missiles with an optical fuse. Art exhibition in Ramenskoye, the 100th anniversary of the Russian Air Force, 12.08.2012 (photo - of pfc-joker is, http://pfc-joker.livejournal.com ). Combat training sample R-73L optical fuse. Su-34 board No. 05 red airbase Baltimore / Voronezh, 08/18/2012 (photo - Sergey Tchaikovsky, http://russianplanes.net/id84363 ). Projection of R-73 - P-73 radar fuze side and top views, P-73L with optical laser fuse is a side view (Figures IVPrihodchenko 2006, http://vadimvswar.narod.ru ). - R-73m / F-73 MDR-2 - a variant of the rocket with improved performance characteristics and a new homing vessel (with the characteristics of the GOS Mayak), was first shown at the MAKS- 1997 airshow. According to the data from the exhibition - rocket tests started at the end of 1994, the rocket is ready for mass production . In general, the creation of the K - 73 modification with an extended defeat zone was initiated by the decision of the military-industrial complex under the USSR Council of Ministers on February 13, 1984. Later, the work on the rocket was set by the Resolution of the USSR Council of Ministers on December 28, 1984 In 1988-1989. made the first 16 prototypes of new missiles.The model of the R-73 RMD-2 rocket has the ability to launch into the rear hemisphere of the carrier and can be used against air-to-air missiles. - K-74ME - export version of the R-73M, probably with a simplified guidance system. First shown at the air show MAKS-1997. Rocket R-74ME (drawing ICB "Vympel"). - R-73K - the name of the R- 73 missiles with a radar proximity fuse. The name is sometimes used. 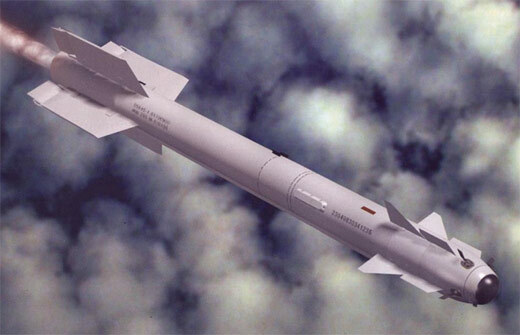 - RVV-MD - probably the updated version of the R-73M / R- 73 missile RDM-2. Developed by GosMKB "Vympel" in the late 1990s - early 2000s. The version of the RVV-MDL rocket is equipped with an optical laser non-contact fuse. The name RVV-MD was first mentioned in the annual report of GosMCB Vympel in 2007. And for the first time, the model of the rocket was shown to the public at the MAKS- 2009 air show. Some sources indicate that the version of the rocket was created as the "second stage of modernization" of the R- 73 rocket. - UZR-73 - teaching and recording with a recorder - rocket simulator, used for training purposes. - R-73UT - training missile R - 73. - B-72 - overall mass model of the R-73 rocket. - "R-73UB" (conditional name) - training and combat version of the missile, equipped with a real warhead and onboard systems. - "R-73UD" (conditional name) - a training version of the missile, without a warhead and possibly without an engine, but with onboard systems. Educational-acting model of the R-73 rocket with a radio fuse. Exhibition of technology of The in Ramenskoye, the 100th anniversary of the Russian Air the Force, 12.08.2012 (photo The - Evgeny Erokhin, http://missilesgo.co.uk ). - the MiG-29 / M / the C / the K and OTHER Modifications. The R-73 missiles on the far underwing pylons under the MiG- 29, mid-late 1980s (photo from the archive Cabal, http://militaryphotos.net ). 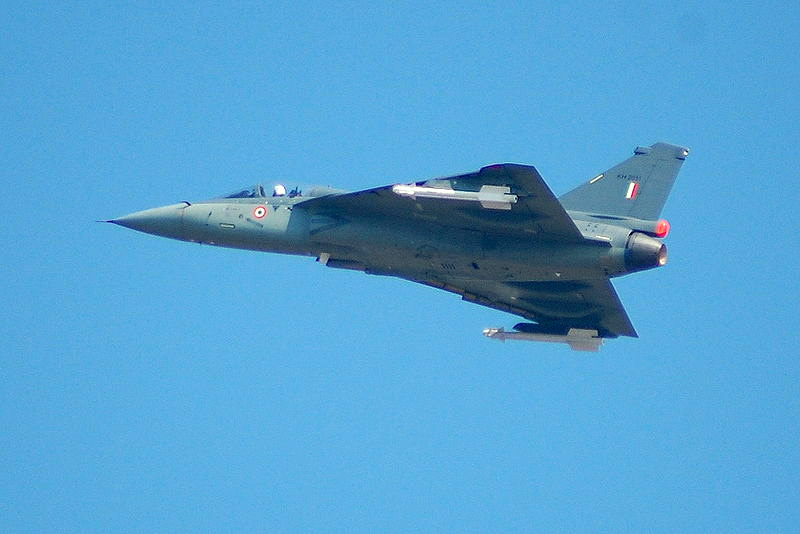 Missiles R-73E fighter Tejas, india ( http://expertshere.wordpress.com ). - Mi-24 - Work was done on the use of K- 73 missiles from Mi-24 helicopters. - in 2013 - is in service. Algeria- 1999 - along with the missile R-23 delivered 289 missiles from Ukraine ( East - R-77. ). - 1999-2010 gg - delivered 305 missiles. Bangladesh - up to 2010 took place the delivery of missiles. Bulgaria - up to 2010 took place the delivery of missiles. Hungary - up to 2010 took place the delivery of missiles. Vietnam - until 2010 there were deliveries of missiles. GDR / Germany - for the MiG-29 aircraft. Later, the P-73 missiles were exported to third countries. Egypt - up to 2010 took place missile delivery (Western data ??). - 1996 - is already in service. - 1999 - R-73E missiles with upgraded standard MiG-21-93 with radar equipment "Javelin" Indian Air Force aircraft. - 1999-2010 gg - delivered about 450 missiles. start of the R-73 when used with supersonic fighter" Thejas " - specified in DRDO. Launch of the R-73 from the Tejas rocket fighter of the Indian Air Force, Goa, 12/07/2013 ( www.livefistdefence.com ). R-73 rockets or their models under the Tejas, India fighter. 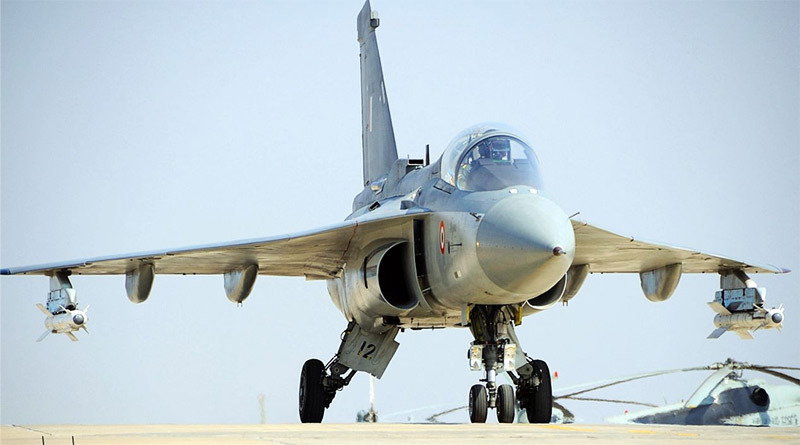 Photo no later than April 2010 ( http://www.indiandefence.com ). Iraq - before 2000, the first shipments of missiles were made . Iran - until 2010 there were shipments of missiles. - 1999-2010 - 8 rockets delivered. - 1992 - is in service. 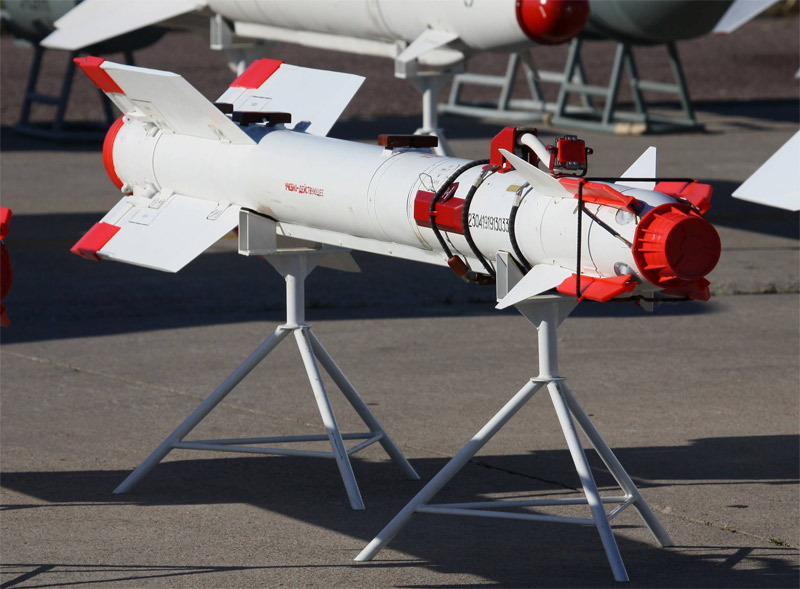 - 1999 - together with the R-24 and X-29 missiles, 11 were delivered from missiles Ukraine ( source - the R-77 missile ). China - until, in 2010 there were shipments of missiles. North Korea - until 2010 there were shipments of missiles. Cuba - by 1996 is in service. 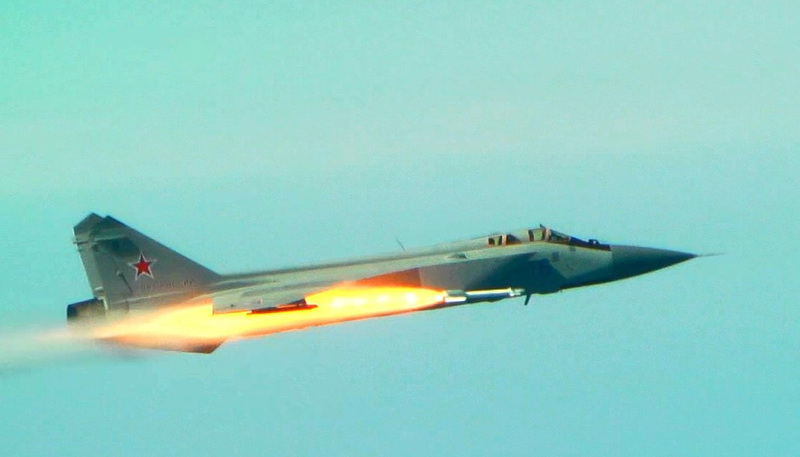 - February 24, 1996 - an interceptor of the MiG-29UB Cuban air force with two R- 73 missiles shot down two Cessna 337 planes of the organization of anti-Cuban activists Brothers to the Rescue. Peru - until 2010 there were shipments of missiles. 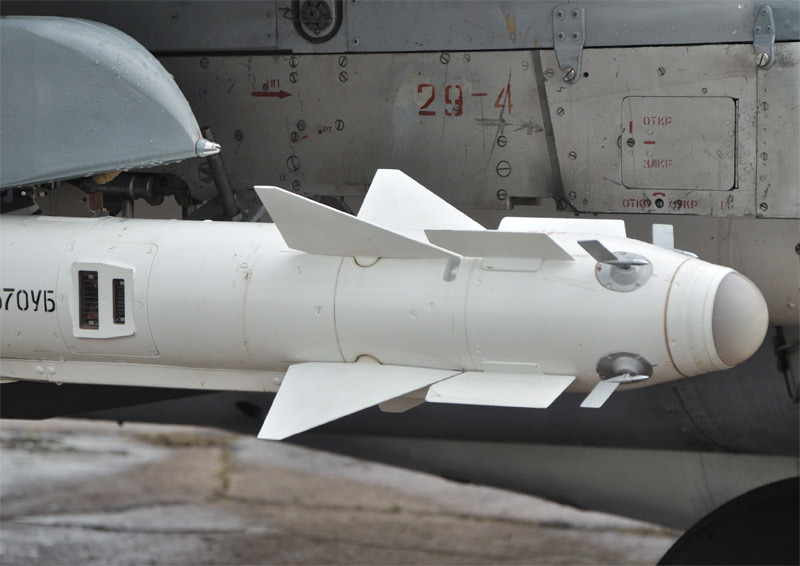 Poland - until 2010 there were shipments of missiles. Serbia - until 2010 there were shipments of missiles. Syria - until 2000, the first shipments of missiles were made . Slovakia - until 2010 there were shipments of missiles. 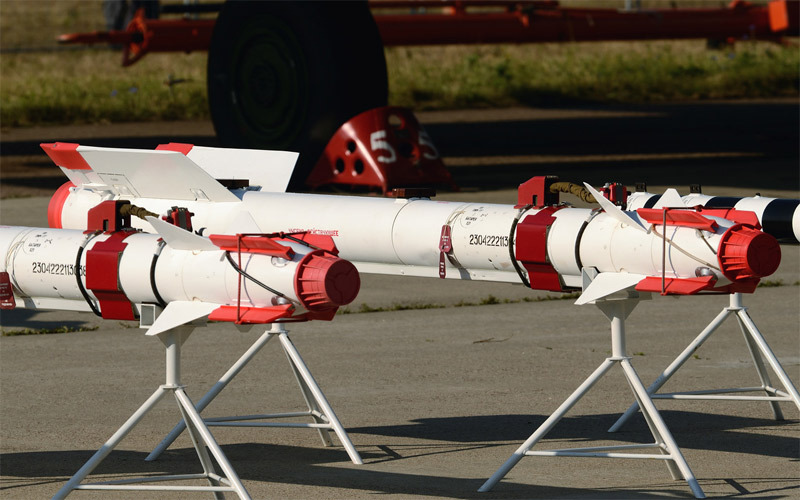 Ukraine ( deliveries of R-73 to third countries missiles were carried out ):- 1999 - together with the R-23 missiles, 289 Were Delivered to rockets Algeria ( -source - the the R-77 missile ). - 1999 - together with the R-24 and X-29 missiles, 11 were delivered to missiles Kazakhstan ( source - R-77 missile ). - 2003 - according to the -source, the expiration date of the engines of the the R-73 missiles of the Ukrainian Air Force expired. - 1999-2010 - Delivered AT Least 5 missiles. Ethiopia - until 2010 there were shipments of missiles. - 2001 - Vimpel GosMCB has embarked on a new direction in the work - experimental design work on the integration of missiles on foreign-made aircraft. The integration of the R-73E rocket into the aircraft of the South African Air Force "Mirage F1" was shown at the Moscow Aviation and Space Salon MAKS- 2001. 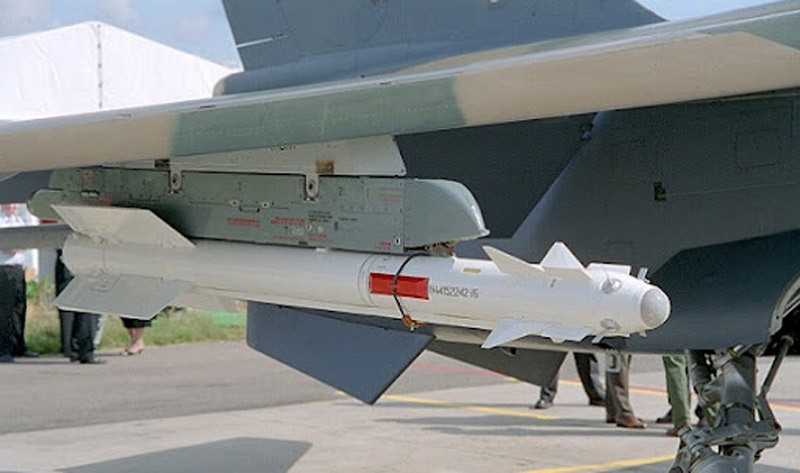 The R-73E missile under the Mirage F1CZ aircraft of the South African Air Force, MAKS- 2001 show air ( http://bayourenaissanceman.blogspot.com ). Yugoslavia - the first deliveries were made before 1993. Exhibition on Khodynka Aviation (Moscow) in August 1989.Angelic R., V. Korovin Domestic air-to-air missiles guided // Technique and armament. No. 9/2005 . 9/1991 Bolshakov L., Andryushkov A., S. Fedotov, MiG-21: long-lived. // A red star. 01/19/1993. A. The Dmitriev, of Prospects for military aviation.// Independent military review. No. 22/1997. Ilyin V., "The English Hound" with red stars. // Wings of the motherland. N 2-3 / 1993. Karpenka AV Rocket short-range R-73. // Bastion. No. Kuznetsov, under the range of screws. // Wings homeland. N 3 / 1993. Levin M., Magnificent Seven. // Wings homeland. N 3 / 1993. Levin M., albeit forgotten. // Wings homeland. N 1-2 / 1993. Claus V., Su-35: Fighter of the next century.// A red star. 09/08/1992. Claus C., made in the Soviet Union. // Avio. No. 5/1996. Museum of the USSR Armed Forces (March 1988). There is even an electric stove on the Su- 35. // News intelligence and counterintelligence. 9-10 N / 1994. Nikiforov A., Under the wing of the aircraft. // Airplane. N 3 / 1993. Nikiforov A. The, That is Necessary! // Airplane. N 2/1993. Nikiforov A., Fedot, but not that . // Airplane. N 4/93. Pstygo I., Tests. // Wings of the motherland. N 2 / 1993. R-77 rocket (CPCP), 2012 ( source ). fleet technique. N 2 / 1990. Tymchuk D. Ukrainian potential - Russia's military might? Site "Fleet in 2017". 2010 ( source ). TsAGI. News foreign science and technology. Series: aviation and rocketry. Technical information. 3-4 N / 1989.